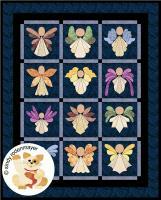 Celebrate the seasons with these three fun, easily pieced, fusible applique mini quilt patterns. These 12" quilts will brighten your holiday decor. Hang the quilts on a table top wire rack for year round enjoyment. See the rest of the quilts in this series below. Wire table stands are available through Ackfield Manufacturing. Pattern designed by Sandi Colwell - Quilt Cabana Patterns.